The end of November found us working with beekeeper trainers who have the goal of using what they learn to start beekeeping co-ops and train others in beekeeping skills. 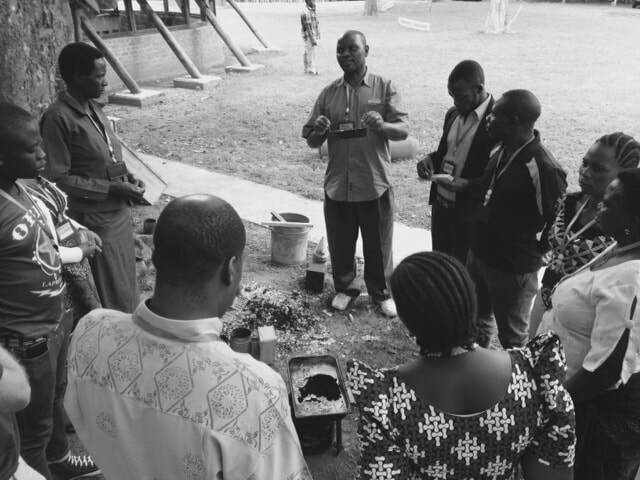 They were a diverse group from different organizations working in Tanzania and private individuals. Two of the participants came from California, United States to learn beekeeping skills so they could travel to Sierra Leone and train their distant family and beekeepers from their families village outside of Freetown! Organizations represented: Mahenge-Ifakara Diocese, Champion Chanzige Secondary School, Peace Corp, Kilimo Timilifu and Emmanuel International as well as interested individuals. Our "trainer group" after receiving their certificates. 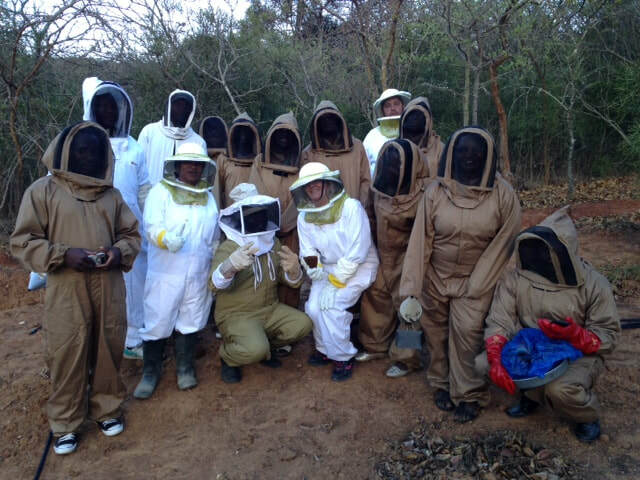 The students who participated in this training have the goal of teaching others throughout Africa in beekeeping skills. 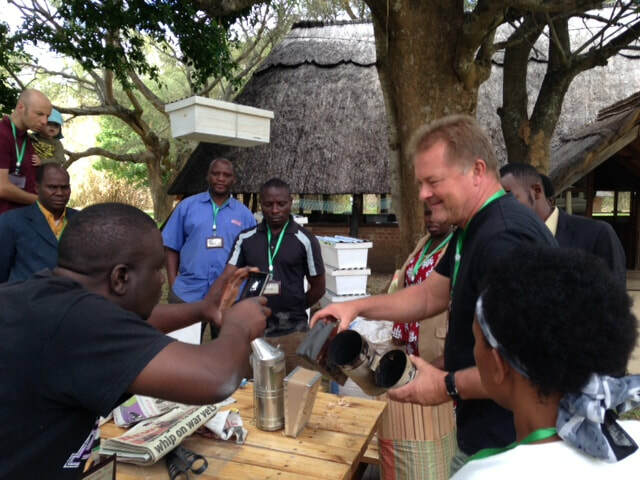 Ted, training beekeeper trainers from Tanzania, UK, Canada and USA in Masumbo camp, Iringa region during the November-December training in 2017. The camp is an excellent venue as it is situated in the Miyombo bush. We put out 20 hives this year for use in our future practical sessions there. We discussed Theory aspects the first day with notable interest in gestation period of the different castes of bees in a hive, as well as duties of worker bees, drones and Queen during their lifespans. How to attract Primary swarms was one of our main focuses. 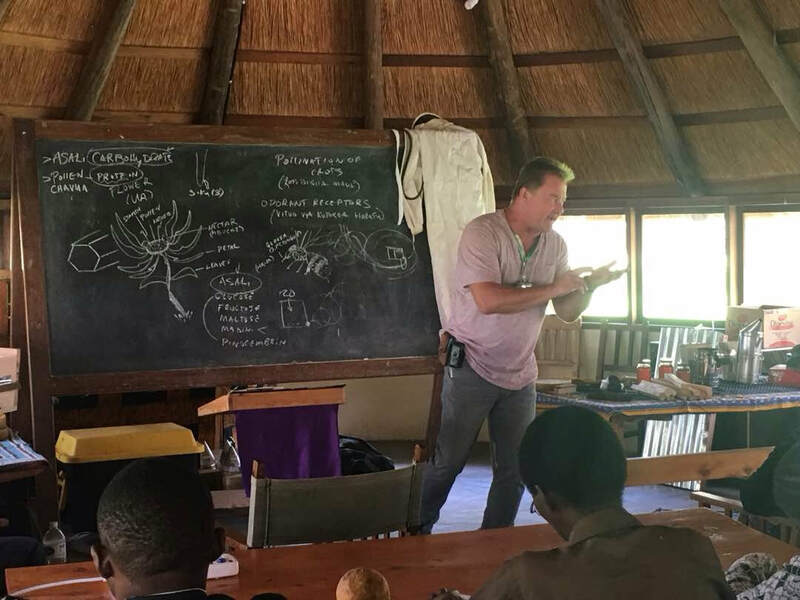 The second day we focused on making starter strips, baiting bee hives to draw primary swarms, and properly hanging hives in the local bush to attract swarms to use in our future training. 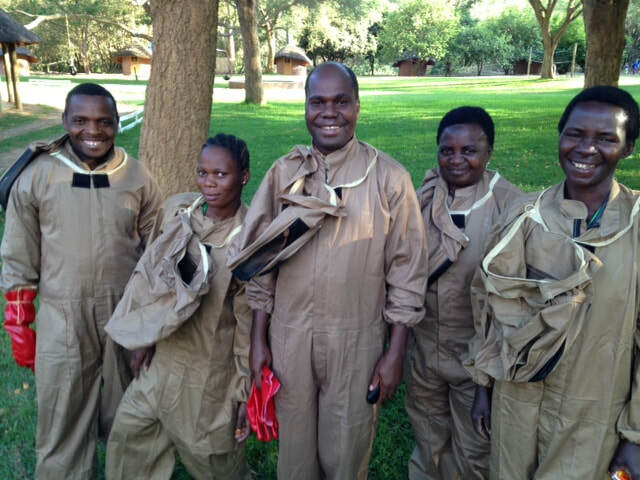 We also suited up and inspected hives near the village of Lundamatwe. The participants got "hands on" experience in starting and using smokers, as well as wearing proper clothing to protect oneself when harvesting. 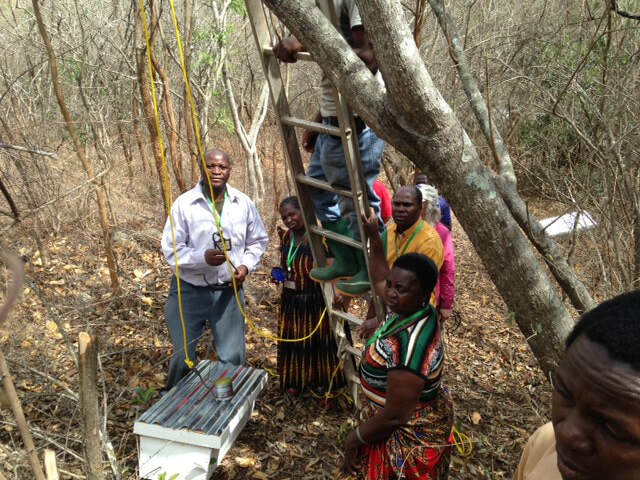 The third day of training we spoke in depth about proper harvesting, processing and packaging of honey. The African beekeeper would do well to set up a beekeeping co-op in the area he comes from so he/she can lobby for good sections of forest for their hives as well as have wherewithal to purchase jars, containers and boxes for use in retail sales of honey. Thanks for your interest in African beekeeping! 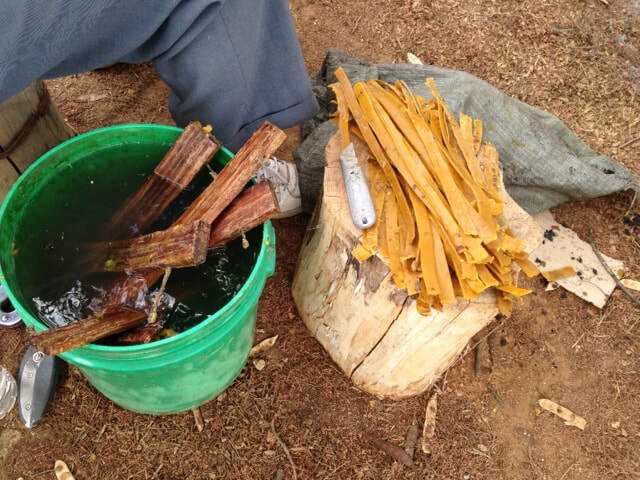 Jericho Mugalla, explaining the purpose of beeswax starter strips and how to make them using common equipment found in most African homes. Glasmo, makes a beeswax starter strip using a hardwood dipping board. 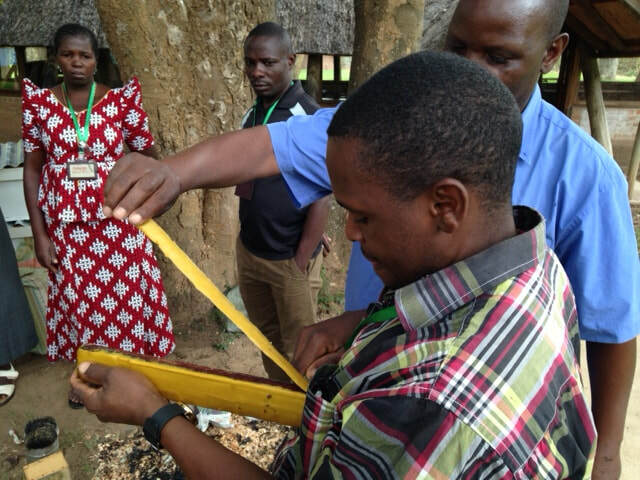 These strips are affixed to top bars enabling bees to draw their combs out one per bar. 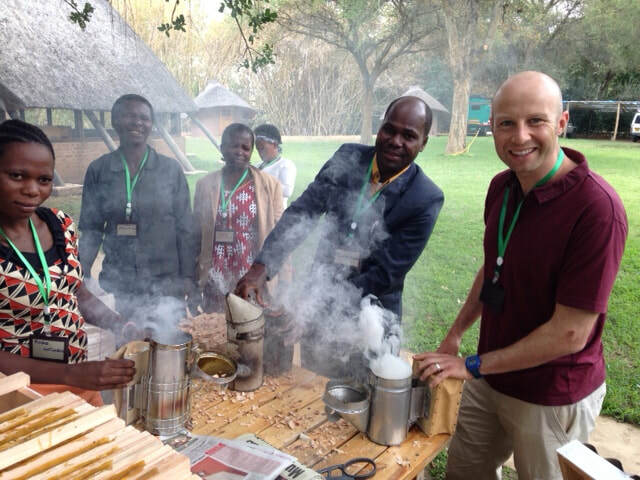 Speaking on the purpose and proper use of smoke in harvesting honey. Dave, from Emmanuel International and Father Placid together with Grace Tulutulu from the Ifakara Diocese firing up their smokers. Hanging hives using hooks during the practical. Hanging hives using the new hive brackets we designed this year. Grease is used to keep marauding ants from entering the hives. 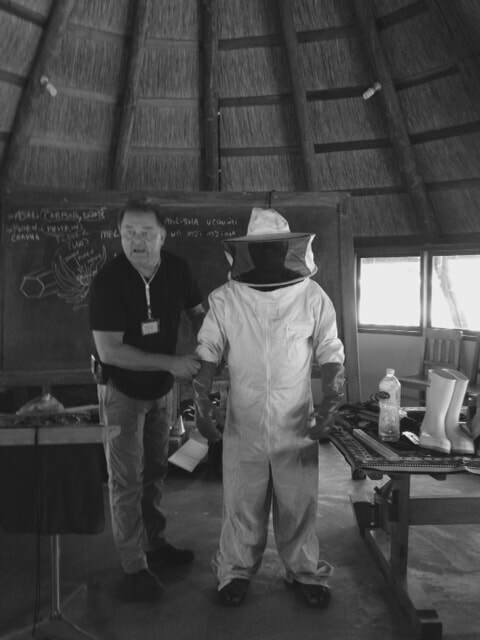 Suiting up Mr. Mkuya in the standard protective clothing used for harvesting honey from aggressive African bees. The team from Ifakara-Mahenge Diocese suited up for their practical training. 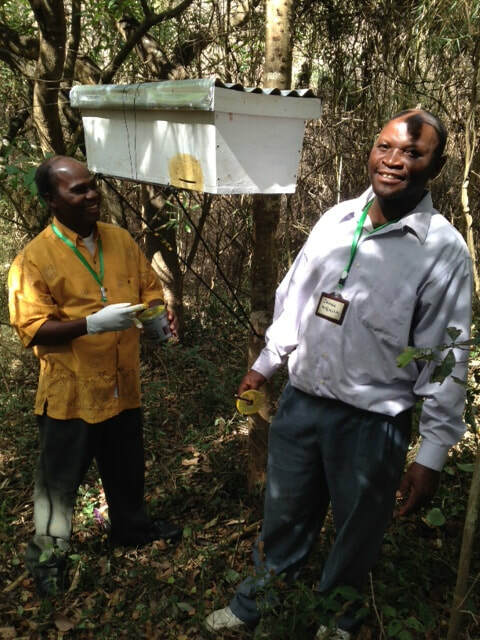 We inspected hives near Lundamatwe village. Inspecting hives with the whole crew! 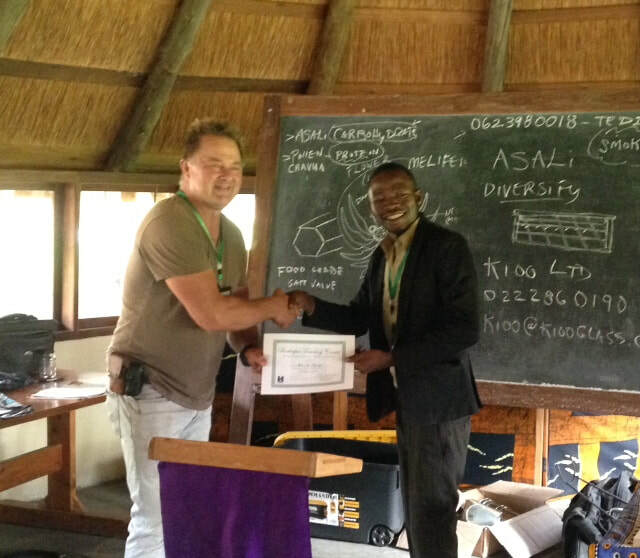 Mr. Kapinga from Champion Chanzige receiving his certificate at the end of the intensive training. 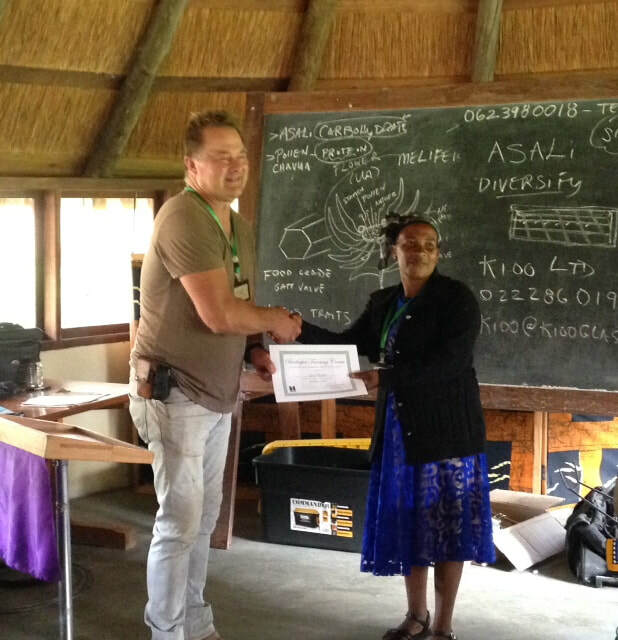 Jessica Mgimba, receiving her certificate upon completing the Beekeeper trainer course.